The American Revolution lasted from 1775 to 1781. After March 17 76, the city ofBoston was never again touched by fighting. Yet no other city played as important a role in the struggle for independence. It was events in Boston that led to the revolution. in 1768 led to the occupation of Boston by British soldiers. From there, problems grew. In 1770, an angry crowd threw snowballs (ev­idently filled with stones and ice) at some sol­diers. The soldiers then fired into the crowd, killing five men; this event became known as the Boston Massacre. In 1773, to protest a new tax. Bostonians, dressed as Indians, threw 400 crates of British tea into the Boston Harbor. In response to the Boston Tea Party, Britain closed the harbor. This response was a severe one, since Boston depended on trade. Before long, colonists in and around Bos­ton began raising armies and preparing to fight if necessary. The first shots were fired in April 1775, in the nearby town of Lexington. In­dependence was formally declared, by Mas­sachusetts and the 12 other colonies, on July 4, 1776. Visitors to Boston can see landmarks of the revolution by walking the Freedom Trail. 2. In times leading up to the Revolution, the Old South Meeting House was a church and, as its name suggests, an important meeting place for the people of Boston. Here leaders such as Samuel Adams and James Otis gave speeches that stirred up the colonists’ emo­tions. Only hours before the Boston Tea Party, thousands met to discuss the tea tax. Later, British general "Gentleman Johnny" Bur – goyne, as a deliberate insult, tore up the church benches and used the Meeting House to ex­ercise horses. 3. The Old State House was the building from which the British had ruled Massachu­setts. On July 18, 1776, the Declaration of Independence was read from its balcony. The statues of a lion and a unicorn, symbols of the British government, were then thrown down into the streets. The streets outside the State House were also the scene of the Boston Massacre, in 1970.
used it as a weapons storehouse and a theater. British officers were watching The Blockade of Boston, a comedy written by General Bur – goyne himself, when someone cried out, "The rebels! The rebels! They’re attacking Charles­town Neck!" The officers roared with laugh­ter—until they reahzed the play had been interrupted by a scene from real life! 5. Paul Revere was a well-known silver­smith and a hero of the revolution. The Free­dom Trail continues to a neighborhood known as North Boston, where visitors can see Paul Revere’s House. This house is the oldest in Bos­ton. In the garden there is a large church bell made by Revere. Nearby there is a statue in honor of Revere’s famous ride to Lexington. by sea. As he galloped to Lexington, Revere saw the two lights. 7. The last stop on the Freedom Trail is Bunker Hill. Colonists defended Bunker Hill against a much stronger British force. The col­onists were defeated, but at a huge cost to the British. Bunker Hill convinced other colonists to fight. For the colonists, it was a victory in defeat. ______ 2. The Boston Tea Party was a meet­ing held to discuss a tea tax imposed by the British government. place mainly in Boston and the surrounding area. 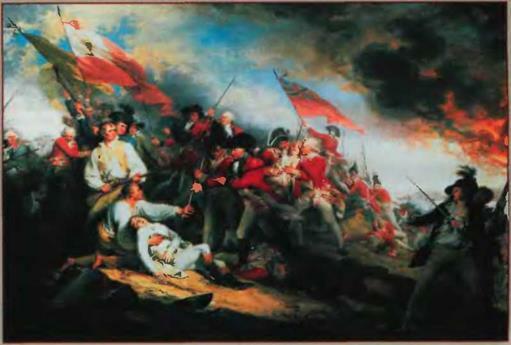 The Battle of Bunker Hill, by American painter, John Trumbull. Food also plays an important part in the fair, both in contests and at vendors’ stands. If you want a piece of homemade berry pie, you’ll have to buy it. But you can get an ear of sweet corn for free. Iowa is, after all, the biggest corn-producing state. Find ten things that you would find at the Iowa State Fair. The words may be horizon­tal, vertical, or diagonal; some are upside down. You undoubtedly know that butter is made from cows’ milk, but did you know that some cows are made from butter? Each year, at the Iowa State Fair, Norma Duffield Lyon uses butter—nearly 1/4 ton of it—to sculpt a life-size cow. The cows are so lifelike that the crowd can easily recognize which breed of cow she has sculpted. 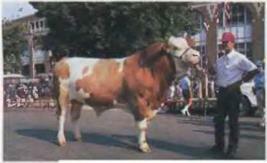 The crowd can also see plenty of real cows—along with bulls, horses, goats, sheep, pigs, and poultry. The farm animals shown at the fair are among the area’s best. The fair is intended as a "celebration of excellence." There are many contests for people, too. You could win a prize for throwing horse­shoes—or for being the man with the best pair of legs! Much to the dismay of the farmers who live there, the Midwest is characterized by ex­tremes of weather: heat, cold, rain, wind, snows, floods. Can you unscramble the weather words on the right and match them with the descriptions on the left? San Francisco is surrounded on three sides by water. It is famous for its bridges, fog, and foghorns. San Francisco has 40 hills. It is fa­mous for its cable cars, which climb these hills, and for its bright houses that cling to the hills along steep and narrow streets. San Francisco is a wonderful city to explore on foot. San Francisco also has a reputation as an intellectual, liberal, and slightly crazy city—a city where new and different ideas can be ex­plored. poetry readings in bookstores and coffee houses. In the mid-1960s, the Haight-Ashbury district of San Francisco gave rise to hippies (and even to the word "hippie," which comes from the adjective "hip," meaning "aware"). The focus was on rock music, drugs like mar­ijuana and LSD, and love and peace. 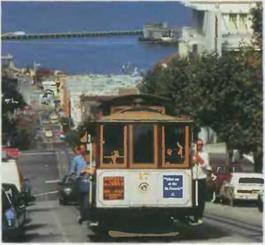 By 1969 buses of tourists were being driven through Haight-Ashbury. known for academic excellence, in the 60s and 70s Berkeley was even more known for student protest. 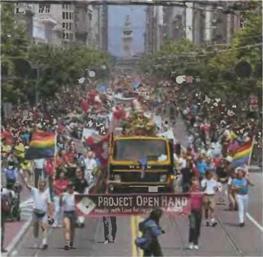 Although many movements have faded from the San Francisco scene, the gay rights movement remains strong. San Francisco has one of America’s largest gay communities. Gays play an active role in everything from the city’s nightlife to its politics. French, called it "Poodle Dog.") Today there are over 4,500 restaurants, serving every cuis­ine including "California cuisine." California cuisine is based on fresh ingredients and sim­ple but unusual combinations, like grilled tuna with raspberry sauce. Bookstores in San Francisco are just as varied. Lawrence Ferlinghetti’s City Lights Bookstore specializes in poetry. Or, if you pre­fer mysteries, there’s a bookstore with noth­ing but mysteries—even its bathroom has shelves of mysteries! To see a genuinely ethnic area, go to Chinatown, the largest Chinese neighbor­hood outside Asia. Don’t leave San Francisco without seeing the structure that has become its symbol—the Golden Gate Bridge. This beautiful orange suspension bridge, which opened in 1937, goes between San Francisco and Marin County to its north. The bridge was first proposed in 1869 by "Emperor" Norton, a forty-niner who, having lost his money and his mind, had declared himself emperor of the United States. Nor­ton’s ideas about an empire may have been crazy, but his idea about a suspension bridge for San Francisco was just ahead of its time. It took twentieth-century technology and the engineering genius of a man named Joseph Strauss to bring the Golden Gate Bridge into existence. 1. Some say Enrico Caruso’s greatest perfor­mance came when he sang the national anthem before a World Series game. 2. The Poulet D’Or, a restaurant that recently opened in San Francisco, specializes in Cal­ifornia cuisine. 3. If you go to a restaurant that serves Cali­fornia cuisine, you are more likely to have fish with berries than steak with potatoes. 4. San Francisco is famous for its cable cars and bridges; in fact, the Golden Gate Bridge has become a symbol of San Francisco. 5. The Golden Gate Bridge was built by an engineering genius who was nicknamed "Emperor" Norton. 6. Over the years, San Francisco has been a center for beat poets, hippies, student protestors, and gays. B. Replace the italicized words with appropri­ate nouns or phrases. 1. It grew rapidly as a result of the Gold Rush. 2. Two of them occurred in 1906 and 1989. 3. There were many of them in Haight-Ash – bury in the mid-1960s. 4. That is what it was known for back then, although today it’s just known for its aca­demic excellence. The value of land in Manhattan has turned the island into a sea of concrete. Fortunately for New York’s residents, there is one major exception: Central Park. young and old." Central Park is still much as he intended. You can take a horse and buggy ride through Central Park. You can explore the park even better by renting a bicycle. Attractions in the park include gardens, a zoo, a skating rink, an old-fashioned carousel, a lake where you can row, and an outdoor theater, where events are held each summer. Central Park was opened in 1876. Wealthy New Yorkers soon built mansions along Fifth Avenue, on the park’s east side. The Vander­bilts. a large family, at one point had eleven mansions on Fifth Avenue! lightful museum to wander through since it’s set up, not like a museum, but as it was when the Fricks lived there. This part of Fifth Avenue along Central Park has so many museums that it’s called "Museum Mile." The Metropolitan Museum of Art, with huge collections of art from around the world, may be the most important mu­seum in the United States. The street on the western side of the park, Central Park West, has large and unusual apartment buildings. When the first one was being built, people laughed. They said no­body with money would live in an apartment house, especially when it was so far from the center of town that it might as well be in the Dakotas (in the western part of the United States; see Unit 5). The builder had the last laugh; he named his building the Dakota, and when it opened, every apartment was occu­pied. The Dakota has had many famous resi­dents, including actress Lauren Bacall and conductor/composer Leonard Bernstein. But, above all, the building makes people think of John Lennon, who lived there and was killed right outside on December 8, 1980.